What If My Employer Won't Allow Meal Breaks During My Shift? 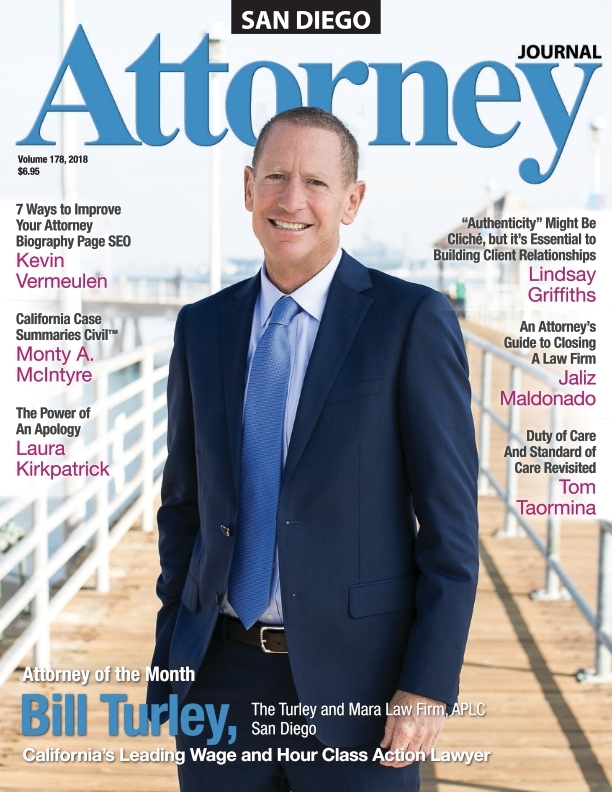 | The Turley Law Firm P.C. California has the strongest worker protection wages laws in the United States. Under California law, you are entitled to take a duty free meal break. What you are going to see is that many employers simply don't meet their burden of providing meal breaks. You might be thinking to yourself, "Why is this important? And, how does this affect me?" Putting aside the human side of it - that is taking a break from work and eating and relaxing, California law says that you are entitled to an hour's pay every time that your employer doesn't provide you with a legally compliant meal break. A lot flows from this - meaning your unpaid wages. That is, failure to be paid for all time worked, pay stub violations, waiting time penalties and the like. If that hasn't gotten your attention, what I say next sure might. Oftentimes you are looking at being owed thousands and thousands of dollars in unpaid wages. Sometimes even tens of thousands of dollars. I knew that would get your attention. I know it would get mine. What are an employer's duty to provide meal breaks in California? 4. Your employer does not impede or discourage you from doing so. Brinker vs. Superior Court (2012) 53 Cal.4th 1004, 1040. This is all based upon the ground-breaking California Supreme Court case - Brinker vs. Superior Court. I know the Brinker case very well, because I represented the workers in the Brinker case. I use the Brinker case all of the time in order to win workers wages in unpaid wages class action cases. Many people say that the Brinker case is the most important California Supreme Court wage and hour case in years (if not ever). In the Brinker case, the California Supreme Court laid out the duties that California companies have, including providing meal periods and rest periods to workers. As you read this webpage on meal break law in California, you will see references again and again to the great law made for California workers in the Brinker case. I can't tell you how proud I am to have represented the workers in the Brinker case. It was a long battle. We went to the California Supreme Court and to the California Court of Appeals three times in fighting the Brinker case. You and every employee in California has benefited from this historic decision. I am privileged to be a part of this powerful history. California law on meal period/ meal breaks are found two places. First, California Labor Code Section 512. Second, the California Wage Orders. What is a “facially unlawful” meal break policy? If your employer has a written meal break policy that doesn’t comply with California law, then it is called a “facially unlawful” meal break policy. Meaning, a meal break policy that “on its face” is illegal. Meaning that it doesn’t comply with California Labor Code Section 510 and/or the relevant Wage Order. For example, we have seen written meal break policies that don’t have a provision for a second meal break at 10 hours. This is a “facially unlawful” meal break policy. Generally in an wages class action case one of the first things we ask for in the discovery process (the part of the case where the company has to produce documents to us) is all of the company's wage and hour policies, employee manuals and the like. Then we do an analysis of the documents in order to determine whether they first have written wage and hour policies and if they do, whether they are "facially unlawful." What if I'm not getting meal breaks / lunch breaks? The short answer to this question is that you need to lawyer-up. I realize that some of you won't or don't like this answer. I get that. But my job is to tell you what you need to hear, not just what you want to hear. One of the reasons why Bill is asked to testify at legislature hearings is because he is known for being straight-forward and blunt. He is known for being no B.S., with no lawyer-talk, no double-talk. Why do we continue to win wage theft class actions? Because we get the nuances in the law. Based upon what I see, many (if not almost all), wage theft law firms call themselves “wage and hour lawyers.” Almost all of the these law firms look for cases that are cut and dry or black and white. And they leave a lot of your wages on the table. You have to look for the edges. They don’t. You have to be willing to think with some imagination. They surely don’t. The reason why I know this is that I keep seeing these other firms in cases and I have to think that most of these lawyers just don't get it. I know I keep coming back to the Brinker case. It might sound old to you by now. It doesn’t for my clients. Why? Because I put money in their pockets because I refuse to let go. So, here I go again. If you are not free to leave the premises during your meal break - then you didn’t get a duty free meal break. In Brinker, the court instructed that for purposes of class certification, the focus must be on the policy the plaintiffs are challenging and whether the legality of that policy can be resolved on a classwide basis. Brinker, at pp. 1023–1024. The Brinker court then considered the scope of an employer's duties under the relevant statutes and the IWC wage orders to afford rest and meal periods to employees. Brinker at pp. 1027–1028. Regarding the meal period claim, the Brinker court concluded that “an employer's obligation when providing a meal period is to relieve its employee of all duty for an uninterrupted 30-minute period” and that an employee “‘must be free to attend to any personal business he or she may choose during the unpaid meal periods’” Brinker at pp. 1038, 1036. Thus, the employee must be free to leave the premises. Brinker pp. 1038, 1036. If you have any duties whatsoever during your meal break - then you didn’t get a meal break. 30 minuted uninterrupted meal break is exactly what it sounds like it is. But even more. So, let’s explore this further. You aren’t getting a 30 minute uninterrupted meal break if 5-10 minutes of it is getting in and out of the warehouse. You aren’t getting a duty-free meal break if you have to keep your radio or phone on during a meal break. You aren't getting a duty free meal break if part of your meal break is spent waiting in a security line. These are just a few of the ways that workers don't get legally compliant meal breaks under California law. Under California Wage and Hour law, any hourly employee working a shift of at least five hours must receive an unpaid 30-minute meal period. You are entitled to a second meal break if you work 10 hours. This is where an unpaid wages analysis comes in. When we conduct a confidential, free, no obligation unpaid wages analysis, one of the things we are doing is comparing your time keeping records to your pay stub records. We are seeing if you are being paid an hour's pay when your meal break is taken before the 5th hour and a second meal break before the 10th hour. I suggest that you claim your confidential, free, no obligation unpaid wages analysis. We go through a comprehensive review in order to determine how much in unpaid wages you are owed. It is just that. Confidential. Free. No Obligation. For more information about our unpaid wages analysis click here. If you signed a meal period waiver, then you have two strong potential arguments to defeat the meal period waivers. First, that like the California DLSE has found, blanket meal period waivers are not valid. You must waiver your meal period on a shift by shift basis. Your employer cannot demand that you respond to cell phone calls, texts, questions from coworkers or clients, or be available to the business in any way. Your employer must completely relieve you of all work duties and ensure that you are free to leave the work premises if you wish. If your employer fails to you provide a meal period, you are entitled to one hour's wages at your regular rate of pay for each day that a meal period was not provided. If your employer requires you to remain at the job site during breaks, but still requires you to clock out, you are entitled to payment at your regular rate of pay for the meal period plus the premium of one hour's pay. If you have not received meal breaks or premium compensation for breaks that weren’t provided, you are entitled to back pay of one hour's pay per day. What Can You Do If Your Employer Refuses to Pay? Even if you told your employer that you voluntarily gave up your break, he still owes you for any time you continued working. If you were not allowed to take breaks, or were told to clock out but stay on-site, you are entitled to back payments and interest for the wage violation. And an hour's pay because you weren't provided a legally compliant meal break. 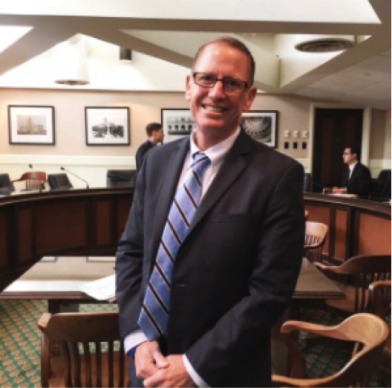 Bill Turley is regularly asked to testify before the California legislature as an expert on California wage law. What if my employer doesn’t have a meal period policy? Some employers have no written meal period policy. This very rarely happens with the large employers. We are usually talking about employers that have 300 or less employees. So what happens then? We have talked about employers with “facially unlawful” meal period policies. Meaning, the written meal period policy they have is unlawful - meaning that it somehow doesn’t conform with Labor Code Secton 512 and/or the Wage Order for the industry. But what about employers that have no written meal break policies? That is, an absence of a meal period policy. Cases after Brinker, have significantly clarified the law with respect to certification of meal and rest period classes when the company has no meal break policy. In Bradley v. Networkers Int’l, LLC there was an absence of a rest break policy. The Bradley court held that the trial court should have certified the issue of a lack of a rest period policy. The employer in Bradley, as usual, argued that the case was all about individual issues as to whether the employees took a rest break or not, even without a written rest period policy. Similarly, the court in Benton v. Telecom Network Specialists held that the denial of class certification was improper in light of evidence that the defendant uniformly lacked a meal and rest period policy. Benton v. Telecom Network Specialists 220 Cal.App.4th 701, 725 726 (2013). In summary, first, if your employer has no meal period policy, you can’t waive what you didn’t get. Second, the argument that some workers actually took a meal break goes to damages, and does not prevent class certification. Nevertheless, there are some Federal District Courts that still don’t certify “absence of policy” case by taking the convoluted view that it is still “individualized issues” concerning whether workers actually took a meal break, even if they weren’t authorized by a written policy. In her concurring opinion in Brinker, Justice Werdegar placed special emphasis on a presumption based on record-keeping obligations. Brinker at pp. 1052–1054. Justice Werdegar stated that when the applicable IWC wage order obliges the employer to record meal breaks, “[i]f [those] records show no meal period for a given shift over five hours, a rebuttable presumption arises that the employee was not relieved of duty and no meal period was provided. … An employer's assertion that it did relieve the employee of duty, but the employee waived the opportunity to have a work-free break, is not an element that a plaintiff must disprove as part of the plaintiff's case-in-chief. Rather, … the assertion is an affirmative defense, and thus the burden is on the employer, as the party asserting waiver, to plead and prove it.” Brinker, at p. 1053. "Justice Werdegar stated that if an employer's records show no meal period for a given shift, a rebuttable presumption arises that the employee was not relieved of duty and no meal period was provided, shifting the burden to the employer to show the meal period was waived." Brinker, at 1052. I can’t tell you how important this is. Because this gives rise to you potentially being owed an hour’s pay for every meal period that wasn’t recorded/ taken. This is one of the things that we look for when we perform our confidential, free, no obligation unpaid wages analysis. Make no mistake about it, lawsuits are all about evidence. And proof of evidence. Who has to prove what in order to prevail is always vitally important in lawsuits. An employer's assertion that it did relieve the employee of duty, but the employee waived the opportunity to have a work-free break, is not an element that a plaintiff must disprove as part of the plaintiff's case-in-chief. Rather, the assertion is an affirmative defense, and thus the burden is on the employer, as the party asserting waiver, to plead and prove it. Brinker Restaurant Corp. v. Superior Court, 53 Cal. 4th 1004, 1053 (2012). It feels really good when you get your check for unpaid wages owed to you! Many employers have an automatic deduction for meal periods. It is essentially a policy whereby thirty minutes are automatically deducted from the employees' paychecks based on the assumption that they take half-hour meal breaks. We have seen this a lot with trucking and delivery companies, but other employers sometimes have what are called “auto-deduct” or “auto meal deduct” policies. Most court's will certify auto-deduct meal period policies and practices. The Wilson Court found the defendants' "assertion is insufficient to defeat certification" and found that Plaintiffs' claims of the auto-deduction policy sufficed to satisfy the commonality and predominance requirements. Wilson v. TE Connectivity Networks, Inc., No. 14-cv-04872, 2017 U.S. Dist. LEXIS 219899, *3, 7-11; 2017 WL 1758048, at *7-11 (N.D. Cal. Feb. 9, 2017). Villa v. United Site Servs. of Cal., Inc., 2012 U.S. Dist. LEXIS 162922, *17, 2012 WL 5503550. Call us at 619-304-1000 - If you call after regular business hours, when you leave a message, be sure to repeat your name and telephone number twice, so we get it correctly. And be sure to indicate whether it's okay if we respond by text. Text us at 858-281-8008 - Be sure and put "new wage case" in your text. Finally, you need to know that every case is different. Just because we have gotten great results in so many unpaid wages class actions doesn't guarantee any particular result in any other case. Like I always say, there are no guarantees in life or law. Bill Turley at the California Senate Hearing April 12, 2016 Bill Turley at the California Senate Hearing April 12, 2016. 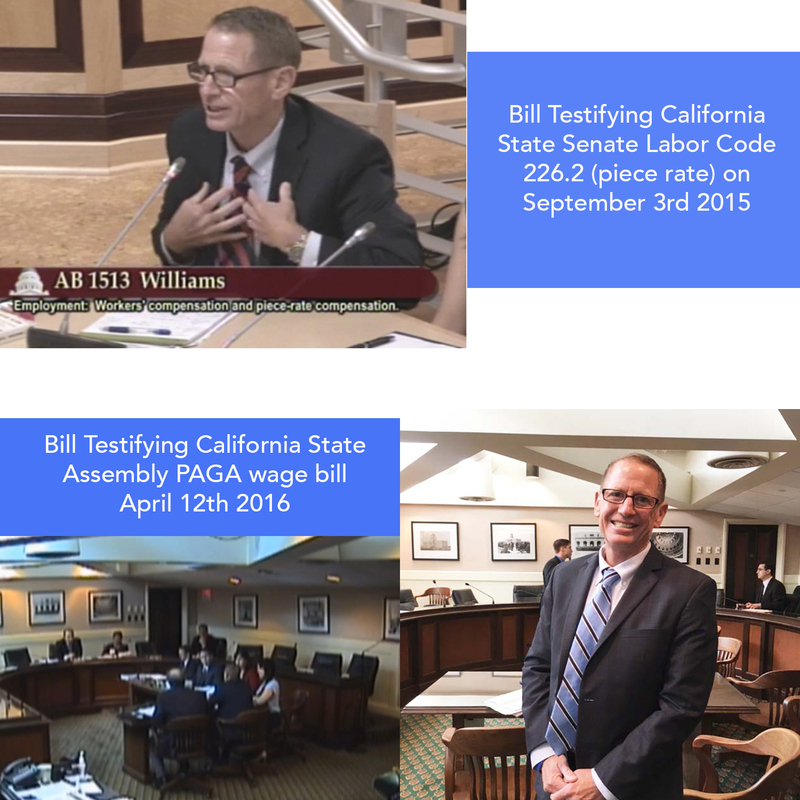 Bill was invited to speak at the California Senate hearing regarding workers rights and wage theft.